Check Our San Angelo Wind Conditions: See if you can see all flags aligned the same ! It is really quite simple. We take a 22 long rifle and put it on a benchrest and shoot 25 rounds at a target for score at 50 yards in 20 minutes. Ten is the highest score that a shooter can make on each shot. 250 is the best possible score for one card. The target is scored ; the target winners gets a pin ; the match director sends the match scores to the 50/50 headquarters in Bristol, TN where they are recorded and posted with other shooters internationally. The bullseye on the target is small, about the size of a .22 bullet and so are the scoring rings. In this game, we are striving for the absolute ultimate in accuracy. Our best shooting rifles are quite specialized with custom actions, barrels, triggers, and stocks, not to mention, 36+ power target scopes. We also have some custom 10/22 styled action rifles that are proving to be quite up to the task and sometimes beating the custom bolt action rifles for a lot less cost. We use 1 piece rests as well as 2 piece rests. The wind is a huge factor on these little bullets. A slight breeze can move a bullet up to an inch. Most shooters use up to four wind flags for fifty yards and wait for the conditions to be the same as the first shot. How we hold the rifle has a great deal of effect on where the shot goes. 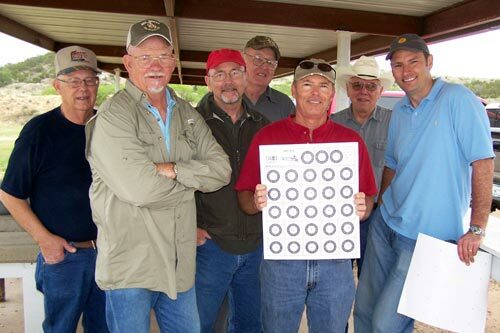 Auto Benchrest Association was begun in Boerne, TX in 2014 and we have been sanctioned since the start. This is similar to the IR 50/50 with the exception of the target consisting of only 20 bulls eyes and a 15 minute time limit. The maximum score is 200. It is designed for use with semi-automatic rifles and the Ruger 10/22 style is one of the most popular and is quite accurate right off the shelf. There are 2 classes shot, factory and unlimited. In addition Junior competitors (7 to 16 years old) shoot beside the Senior competitors, with each class separated for scoring. 2 piece rests are utilized and this is a great sport for the whole family. One of the best things that we have seen is that the match scores are so close to each other, many times being separated by only 1 point over 4 targets, so it is the ultimate close competition. We all enjoy the company of others. We shoot for the fun of it but we shoot as well as we can. We all help each other and we are all excited when someone shoots a good score. Come on out and shoot with us. You will find friends here.